Hey Tampa Bay.. Alex here with some more news on local entertainment. If you are a fan of Tosh.0 or are just in need of a good laugh make sure you purchase your tickets to go see Daniel Tosh perform at the David A. Straz, Jr. Center on October 17. Tickets go on sale this Thursday, June 17. Daniel Tosh, host of the insanely successful and popular Comedy Central series, Tosh.0 will embark on a massive national stand-up tour this fall. Tosh Tour Twenty Ten: A Comedy Central Live Event kicks off in September in Arizona and travels to more than 60 cities, with additional shows to be announced. Tosh will play Carol Morsani Hall at the David A. Straz, Jr. Center for the Performing Arts (formerly Tampa Bay Performing Arts Center) on Sunday, Oct. 17, at 7 p.m. Tickets go on sale on Thursday, June 17. 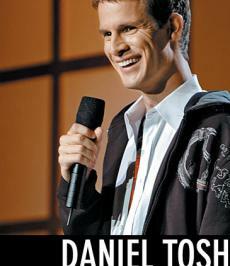 For those of you who have never seen or heard of Tosh.0 here is a little insight on the show. Tosh.0 premiered on June 4, 2009, and features the razor sharp humor and biting commentary from comedian Tosh and delves into all aspects of the Internet from the absolutely absurd to the incredibly ingenious in this weekly, topical series which airs Wednesdays at 10:30 p.m. ET/PT. The series also features viral clips of the week and original videos created by and starring well-known actors and comedians. Each episode features the segment "Web Redemption," which gives subjects of infamous viral videos (i.e. Phillies Fan and Make It Snow Girl) a second chance to redeem themselves from the embarrassment with which they&apos;ve become synonymous. Currently in its second season, Tosh.0 is a huge ratings success for Comedy Central, averaging 1.8 million total viewers. The series is the most watched show in cable on Wednesday nights among men 18-24 and men 18-34. Since its first year, ratings have enjoyed a meteoric rise in the following demos: Persons 18-49: +75%; Men 18-34 +98%; Men 18-24 +98%. As you can see Tosh.0 is quite a hit. So, don’t wait until the last minute to purchase your tickets. They go on sale this Thursday, June 17, 2010. Check back often for more arts and culture in Tampa Bay information on Tampa Bay area events!